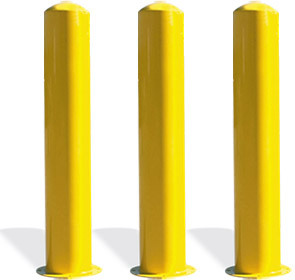 Bollards act as a protective guide that clearly identify restricted areas, delineate traffic patterns and are a helpful guide for both pedestrians and motorists around precarious turns, corners and intersections. Designed with form and function, this steel Safety Bollard is available in 3' and 4' heights configured for in-ground or surface mount installation. This heavy-duty round powder-coated steel Safety Bollard can be used as a standalone or group fixture, popular choice for drive-thrus, medians and parking garages. Models available with single sided or double sided loops for connecting chains.